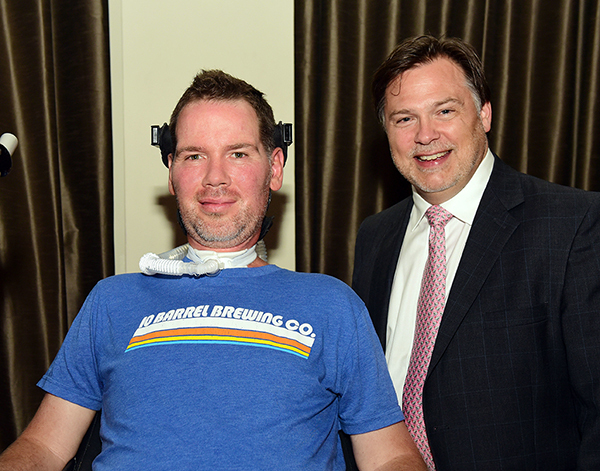 Steve Gleason (MBA ’11), left, and James J. Buquet III (MBA ’90) were honored as Tulane University’s 2017 Entrepreneurs of the Year at a ceremony in the Audubon Tea Room on April 20. The Freeman School honored business executive James J. Buquet III (MBA ’90) as Tulane Distinguished Entrepreneur of the Year and ALS activist Steve Gleason (MBA ’11) as Tulane Outstanding Social Entrepreneur of the Year at the 2017 Albert Lepage Center for Entrepreneurship and Innovation Awards Gala. The ceremony took place on April 20 at the Audubon Tea Room in New Orleans. 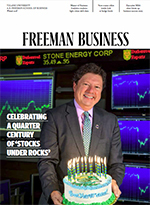 The Freeman School’s Lepage Center for Entrepreneurship and Innovation presents the awards each year to highlight outstanding entrepreneurs in the community. The Tulane Distinguished Entrepreneur of Year Award honors individuals who combine a history of entrepreneurial success with philanthropic generosity and service to the community. The Tulane Outstanding Social Entrepreneur of the Year Award recognizes individuals who are solving social problems and meeting community needs through the use of entrepreneurial principles. Buquet is president and CEO of Buquet Distributing Co., an Anheuser-Busch InBev distributor for Southeast Louisiana. Founded in 1953, the family-owned business wholesales over 250 different brands of beer, wine, spirits and non-alcoholic beverages to nearly 1,000 accounts in Terrebonne, Lafourche and St. Mary parishes as well as parts of Assumption Parish and Grand Isle in Jefferson Parish. Buquet also serves as chairman of the board of Coastal Commerce Bank, vice chairman of Louisiana Community Bancorp, and vice president, treasurer and board member of the James J. Buquet Jr. Family Foundation, which support a wide range of philanthropic causes throughout Louisiana. He serves on the boards of organizations including the Public Affairs Research Council, the Greater New Orleans Foundation, Bayou Community Foundation, the Nicholls State University School of Business Advisory Board, YPO Louisiana and the Houma Terrebonne Chamber of Commerce. Former New Orleans Saints player Steve Gleason founded Team Gleason in 2011 after he was diagnosed with amyotrophic lateral sclerosis (ALS), the neuromuscular disorder also known as Lou Gehrig’s disease. Through the foundation, Gleason has worked to raise public awareness of ALS, promote scientific research and help provide patients suffering from neuromuscular diseases with leading-edge technology, equipment and services. In July 2015, President Barack Obama signed the Steve Gleason Act into law, ensuring the availability of communication devices for individuals with ALS and other neurological disorders.